Carla’s mission is to meet all of her clients’ needs to the extent that they feel as though she is solely taking care of them. She was born and raised in Fayetteville and learned the importance of customer service from her parents, who’s family business was the former Haymount Market. Carla has been with Townsend Real Estate for 10 years and came into the field with extensive knowledge about real estate. 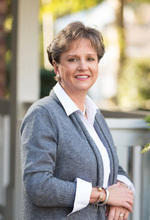 She earned her Bachelor’s Degree in Criminal Justice from Appalachian State University and prior to Real Estate, she was a legal assistant for the Law Firm of McGeachy, Hudson & Zuravel for 17 years, working primarily in the Real Estate Department. When Carla is not hard at work, she relishes spending time with family and friends. She has a daughter and granddaughter in Jacksonville, NC and two sisters in Arlington, VA. The majority of her extended family still lives in the Fayetteville area.